If you haven’t had your female cat spayed or desexed and you find her acting a little strange, she may very well be pregnant. Cats can become pregnant at four months of age and are called 'queens'. Although most veterinarians recommend having cats desexed at 5-6 months, some will perform the procedure earlier. In order to avoid kittens ending up in already-overpopulated shelters and then ultimately euthanised, all pets, both male and female, should be desexed except if you are a licensed breeder. Unless you are absolutely sure that you have the capacity and resources to care for a litter of kittens and can find suitable and loving homes for each of them, you should talk to your vet about having your cat spayed while in the early stages of pregnancy. Spaying will remove your cat’s reproductive organs and any foetuses. Late term spaying is not common or advisable. If you decide to allow the pregnancy to continue there are a number of things to be aware of. Although you can buy pregnancy testing kits, they are not always accurate. If you think your cat is pregnant, consult your vet who will perform an ultrasound to confirm. In later stages, an X-ray and determine the exact number of foetuses present. Your vet may recommend changing your queen’s diet to ensure additional protein and calcium or supplements. It is essential that any vaccinations, worming, parasite and flea treatments are only carried out by a vet on a pregnant animal. The gestation period for cats ranges from 63 - 68 days. During the first few weeks, the only sign of pregnancy will be a small amount of weight gain. Foetal heartbeats are detectable by 20 days and your vet will be able to feel the presence of kittens around 17 - 25 days. However, you should not do this yourself as you may cause a miscarriage, injure the developing kittens or your cat. A pregnant cat four days before delivery. The queen should be separated from any other animals in the house during the last few weeks of pregnancy and kept indoors. One week from delivery you should see the vet for a final check. You can assist your cat with nesting by giving her a large box or basket lined with newspaper, towels and blanket. Place it in a quiet, warm spot and to make it easier for her, cut a section of the box or basket away that she can use as an entrance. Bring her food and water bowls near and have her litter tray accessible close-by. When it is time for labour, it is best that you monitor her but do not interfere unless she, or the kittens are in danger. 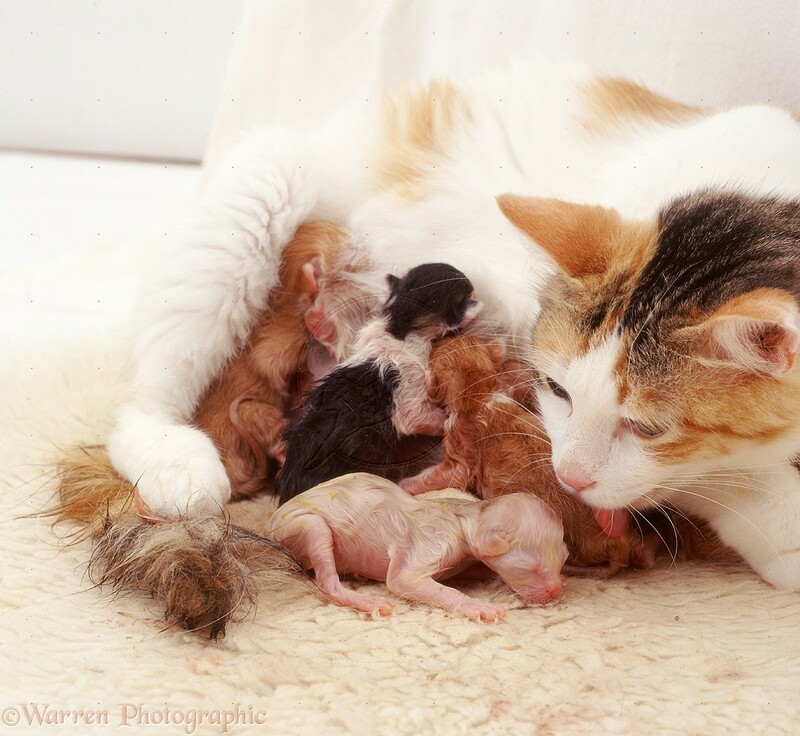 The first kitten is usually delivered an hour after labour starts and then others will arrive from a few minutes to over an hour apart. Each kitten will arrive in a small sac filled with clear fluid. The mother will start licking the kitten to break this sac and allow the kitten to breathe. This licking will also encourage the kitten’s respiratory and circulatory systems. If she does not do this, you will need to puncture and tear the sac from around the kitten’s faces and gently rub the kitten with a towel. The mother will also chew off the umbilical cord and eat the placenta. If needed, you can use dental floss or sterile string to tie off the cord yourself, leaving about an inch. Otherwise you should not handle the kittens for at least 4-7 days after birth. It is important that you only get involved if absolutely necessary as all of these activities start the bonding process and allow the mother and kittens to familiarise their scents.